Steam floor mops, such as the Shark and similar floor cleaners, have put a whole new spin on washing floors, offering both robust cleaning power and convenience. There are no spills rinsing, smells, hand-wringing, or deep bending. 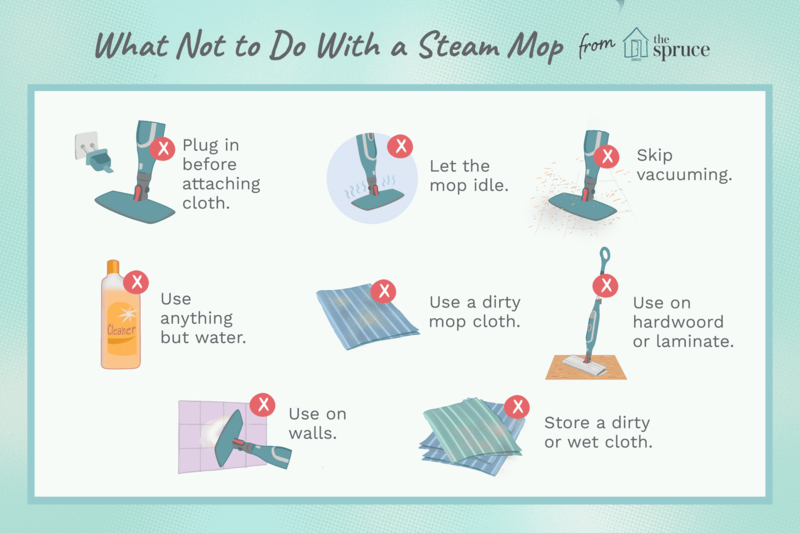 But steam floor mops do need a little care, and there are a few things you shouldn't do with one. Take time to fill the water reservoir, unwind the cord, and attach the mop cloth before you plug in the steam mop. Plugging it in should always be the last step. When the reservoir needs filling during the cleaning process, take the time to unplug the mop before refilling. You're ready to start cleaning the floor and you've plugged it into an outlet, but then the phone rings or someone's at the door. Or maybe you figure there's time to do something else while you wait for your mop to heat up. Don't do it. 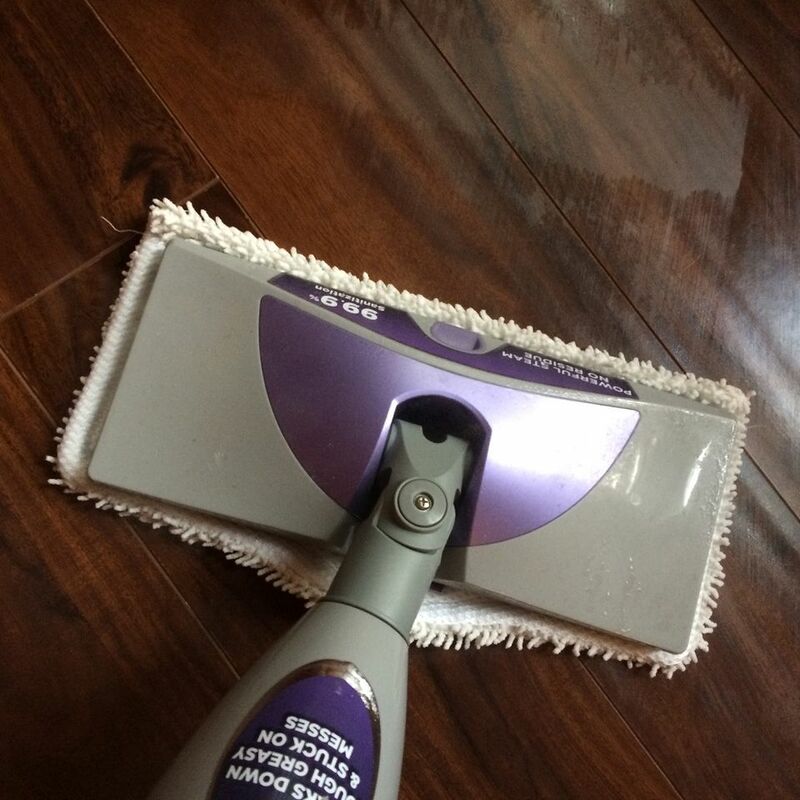 Floors should be vacuumed or swept before they are steam-mopped. If ​you skip this step, any surface dirt, sand, dust, crumbs, and hair will be picked up by the steam mop, hindering its ability to do a good job. It's similar to washing a window with a dirty cloth. Mopping without vacuuming also means you have to change the mop cloth more frequently. With the exception of a few models that have dual functions, steam mops are typically designed to be used with water and nothing else. The steam alone does a great job of cleaning the floor. Always read the manual thoroughly for complete use guidelines. When you have a large floor area or more than one room to clean, it can be tempting to just keep mopping and ignore the amount of dirt buildup on the mop cloth. But cleaning with a dirty mop just spreads the dirt around. For this reason, it's a good idea to have one or two spare mop cloths on hand so you can put on a fresh one when needed. Remember to unplug the mop first. Laminate flooring is made up of prefinished planks, and the seams between the planks are not sealed. The seams can let steam reach the core of the flooring material, which is highly vulnerable to moisture. Also, avoid using a steam mop on any type of flooring that should not have hot water on it, or on adhesive tiles with lifting corners. While using a steam mop to wash walls doesn't sound like a bad idea, hot steam could cause paint to bubble, peel, or lift. If so, it's also likely to damage the drywall or other material under the paint. Leaving a wet mop cloth on when storing your mop could result in mildew as well as ruining the cloth head. Remove the cloth after the mop has cooled. It's fine to add a clean cloth if you want the mop to be ready to roll the next time you need it. Laundering the dirty cloth immediately will help to remove stains before they set in. Most steam mop pads can be cleaned in the washer with like-color items, but they should be air-dried. Many are microfiber, and with this type of material, you shouldn't use fabric softener or a dryer sheet.